Accompanying an earlier volume surveying houses completed by Ando, this second part focuses solely on buildings built predominantly in the Western world, in particular, the USA, England, Germany, France and Italy. 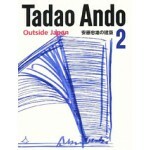 Handsomely produced, all projects are complemented by observations and commentaries by Ando himself, clearly photographed in full colour and accompanied by plans, models and sketches. A total of 26 works are extensively examined, including attention to notable details, the location and site of the building, and of course Ando's hallmark use of concrete. A total of 26 works are extensively examined, including attention to notable details, the location and site of the building, and of course Ando's hallmark use of concrete. A useful chronological table of projects dating from 1990 to 2008 places the examined works in the context of the architect's wider development.